Los Angeles, CA, May 7, 2012 - Halo-8 opened up pre-orders today for the new 2-Disc DVD Special Edition of acclaimed documentary Grant Morrison: Talking With Gods , about the comic book visionary behind The Invisibles, All Star Superman, and the recent Action Comics reboot. The double-disc set features a gorgeous cover illustration by Camilla D'Errico and will be released May 16th through massmarket retail as well as to Direct Market comic book stores through Diamond Comics Distributors. Halo-8 has also made a standalone disc-2 available in its Halo8store for owners of the original edition who wish to upgrade. Directed by Patrick Meaney for his Respect Films banner with Producer/DP Jordan Rennert and produced with SequArt Publishing, this new edition precedes the August 14th release date for the team's follow-up WARREN ELLIS: CAPTURED GHOSTS. Meaney and Rennert are currently producing CHRIS CLAREMONT'S X-MEN, THE IMAGE REVOLUTION, and the OCCUPY COMICS documentaries. This Special Edition features over an hour of never before seen material including Morrison's magic rituals, an examination of his creative process, and an extended interview with Frank Quitely. "Grant Morrison is a transcendent, transgressive artist, he changed the way a lot of us read comics while also blowing the minds of people who don't read comics at all," said Halo-8 president Matt Pizzolo. "Patrick, Amber, and Jordan have put together a smart, slick, and insightful film that offers a deeper look at the writer without demystifying him... that's no simple feat." "It's extremely exciting to partner with Halo-8 to release this film. They have extensive experience releasing films that are challenging and transgressive, just like Grant's work, so it seems like the perfect match. I've been nothing but impressed by their plans for getting the film out there," said Meaney. "Talking With Gods is a unique film that needs a unique distributor and Halo-8 is the perfect match." "We're encouraged by the enthusiasm and experience that Halo-8 is bringing to the project," said Yoder. "They know our audience and the marketplace, and we're excited to be working with them." 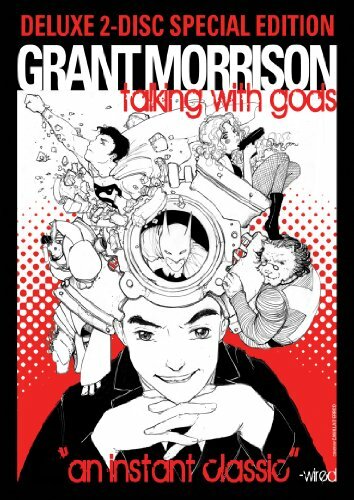 Grant Morrison: Talking With Gods examines Morrison's 30-year career and the real-life events that inspired his stories. Featuring extensive interviews with Morrison himself, the film delves into his early days growing up in Scotland, the start of his career in comics, the crazy years of the '90s as his life and his comics became enmeshed, and his recent attempts to turn personal troubles and social darkness into compelling comics. The film also gives insight into his creative process, including a look into his vaunted idea notebooks. Complementing Morrison's own words are interviews with many of his most important collaborators, including Warren Ellis, Geoff Johns, Douglas Rushkoff, Frank Quitely, Dan DiDio, Frazer Irving, Phil Jimenez, Cameron Stewart, Jill Thompson, Mark Waid, and others. "The film is designed to be accessible both to long time fans of Morrison and to people who don't know who he is but are interested in the story of a modern philosopher and magician with radical ideas about the universe and our place in it," said Meaney. Halo-8 Entertainment(www.halo8.tv) is a film, comics, & transmedia studio that marries art with technology, producing and distributing daring, creator-owned media. The studio is known for integrating film with tech innovations such as the "illustrated film" format designed for GODKILLER which Wired called "a horrific yarn of quantum physics, culture jamming, and conspiracy theory," for supporting outsider-culture documentaries such as the comics-writer bio-doc GRANT MORRISON: TALKING WITH GODS which Wired called "an instant classic" and Ain't It Cool News called "bold, brave, and honest," and for championing controversial documentaries such as the animal rights film YOUR MOMMY KILLS ANIMALS which Variety called "a miraculously evenhanded treatment of a snarlingly divisive debate" and currently holds a 91% positive ranking on Rotten Tomatoes. Upcoming releases include CTRL+ALT+COMPETE, a documentary about startup-culture and creative/tech entrepreneurship featuring Atari-founder Nolan Bushnell, Twitter-financier Mike Maples Jr, and The Guild creator Felicia Day; and WARREN ELLIS: CAPTURED GHOSTS, a documentary about the visionary, influential comics writer & futurist behind groundbreaking series Transmetropolitan, Planetary, Fell, The Authority, featuring interviews with Academy Award-winner Dame Helen Mirren, Avengers-director Joss Whedon, illustrator Darick Robertson, sci-fi hero Wil Wheaton, and many more.